Innovation doesn't have to take a year, cost millions, and cause migraines. At Red Dot, we believe that innovation is a mindset and a process, limited only by imagination. We are a one-stop partner in your digital transformation journey, bringing the best of human-centered design and agile process from Singapore and Silicon Valley. We help you think bigger, launch quicker, and work smarter. We are also entrepreneurial consultants: we don't stop at reports, we get results! We animated leadership breakfasts, strategy sessions, and brought human-centered and agile training to all levels of the organization (even workshops in creole!). We are now starting to build innovation labs for some customers. We guided the service team through a customer journey mapping exercise, user interviews, usability testing, and three iterations of wireframes, resulting in a mockup of a new digital platform in 2 weeks. 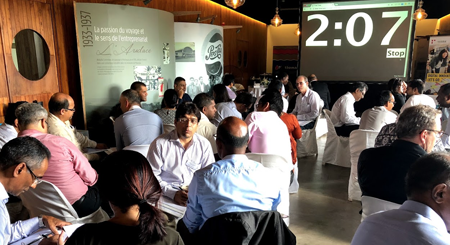 As part of a larger group strategy for operational excellence, Red Dot is facilitating a regular forum to bring different member companies together to identify opportunities, challenges, synergies, and best practices. 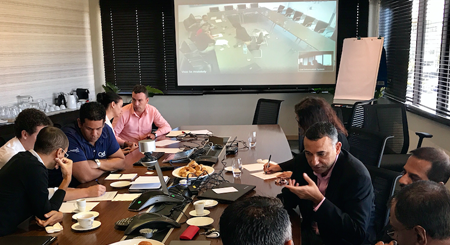 As part of a Hackathon initiative, we led a strategy session to measure and prioritize the outcomes, worked with business unit leaders to identify, align, and frame high-priority challenge statements, and coached participating teams. 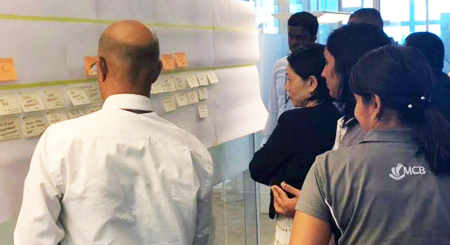 We facilitated an innovation sprint for an internal cross-functional team, that went from "wicked problem" to digital prototype, tested with real customers in 5 days. One customer thought the prototype was live and had taken 9 months to build. We quickly realized that a fear of failure was a major blocker of innovation across all our customers, and brought #FuckupNights to Mauritius, an international movement across 250 cities, where professional failures are celebrated and learnings shared. "Thanks to Red Dot for exposing people to these global ideas. It is a mind-opener." "Workshop as conducted by Red Dot are a must for every corporate to rejuvenate and re-energize the thought process of their leadership teams, highly recommended!" "We really enjoyed the workshop led by Red Dot, filled with disruptive thoughts and concepts, intelligently paced and balanced between theory/information and interactive participation, and explained with a level of enthusiasm and energy that definitely urge you to start acting for change!" We are an entrepreneurial consulting firm, and value action more than just talk or impressive reports. We measure ourselves by successful product launches, positive impact on people, and how much our customers learn. We have launched products, built teams, and sold companies. We love technology, have a head for business, and understand that transformation ultimately happens through people. Our customers bring us in to expand their thinking and build a culture where new things get done. Best of all, we're based in Mauritius. So, the question is, are you ready?